In my professional life, one of my responsibilities is to proof written materials. In this role, I look for mistakes and fix what is wrong. In other words, I see what I’m looking for. But I try to be mindful about not looking for mistakes in other areas of my life. When it comes to people, I work hard to look for what is right and good. I am moved by their passions. I spot the traits that I aspire to, and try to incorporate them. I focus on their strengths and value the gifts they bring to the table. And find joy in encouraging them to use their gifts. There’s nothing more beautiful than watching someone shine in their natural abilities. Bringing out the best in someone else brings you joy. And it’s possible to do, even with people you may not particularly like! It’s rather amazing how looking for the best in others can bring out the very best in you. What do you see? What are you looking for? Something very beautiful happens across the street. And it’s been happening for quite some time, long enough so that I can’t pinpoint exactly when it started. I don’t often see them go into the apartment complex across the street. I’ve only seen two or three enter the building over the years. They looked as if they’d lost all hope. Their bodies bent by some unseen weight on their shoulders. As if every drop of strength had been beaten out of them. seemingly at the end of their rope. No, I haven’t seen many go in, but I have seen them come out. Usually between 8:00 and 9:00AM. Sometimes just one, other times they exit in groups of two or more. Always groomed. Clean clothes. A travel coffee mug in hand. And on their backs, a backpack that I imagine is filled with their meager belongings and maybe a snack for the road. Their bodies still bent, yet maybe a little less so. I think an angel lives across the street. A kind soul who takes pity on those who live on the fringes of society. A loving human being who gives them shelter at night. An angel of mercy who washes their clothes and lets them have a shower. A compassionate man or woman who may even feed them breakfast before they head out for the day to face the harsh reality of their lives on the street. 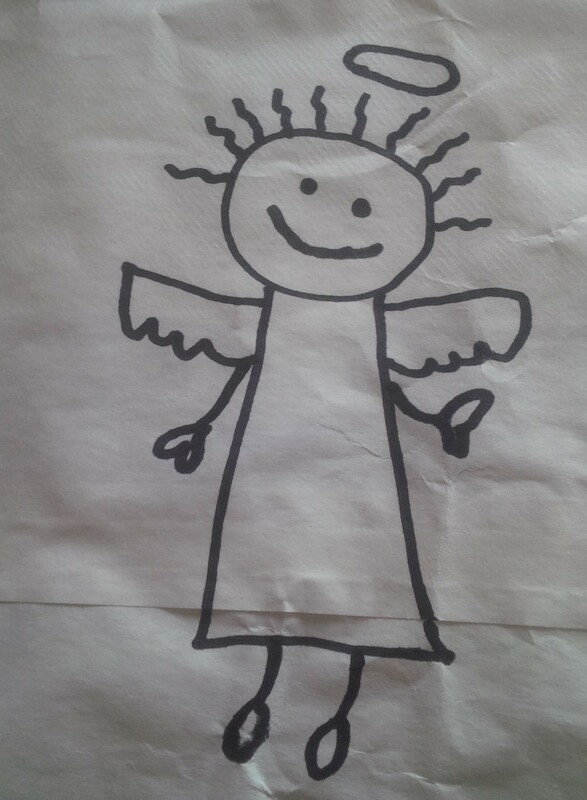 The actions of this angel do not end homelessness in this cold Canadian city. These actions do not provide a permanent solution to homelessness. But to each individual person who is touched by this angel, these actions must mean the whole world. I don’t really know what happens across the street. But I believe I am witness to something quite extraordinary. The truth is, I don’t think knowing more is even necessary. Something tells me the benefactor across the street is not doing it for recognition or praise. That shining a light too intensely on his or her kindness would somehow ruin these beautiful acts. I think an angel lives across the street…and that’s enough for me. I have marveled and wondered a lot about the activities across the street over the years. 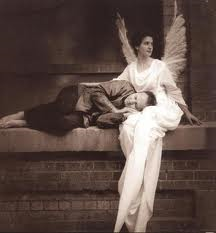 Does your neighbourhood have an angel? Can you think of a time when you witnessed an act of compassion and kindness that touched you deeply? How do you ‘be good’? Have you ever been caught up in a conversation about what it means to be a good person? Or found yourself going back and forth in a thought loop about it? Maybe it’s because I’ve been conditioned to do so. You know, like in a job when you want to do something good. And tweak as you go along? That’s all fine and dandy at work, but is that all there is to it when you want to be a good person? I’ve been thinking about this since reading the above quote and in light of choosing service as my word for 2015. Maybe it’s as simple as the difference between doing good and being good. Doing good in a work setting, takes planning. …acting in the moment, from the core of who you are, when an opportunity presents itself. I know I’m not the first person to ponder what if and I probably won’t be the last. Even as a child, I would question the way we humans treated each other while at the same time I know full well that, at times, I’ve treated people differently based solely on their appearance or status. I clearly remember wishing that humans would intentionally start marrying people outside of their race and having children. My child-mind wondered how many generations it would take before we all looked alike, spoke the same language and adopted similar values and beliefs. I still find myself yearning, praying and wishing because isn’t every person worthy? What if it didn’t matter if you were black, white, red or yellow? What if it didn’t matter if you were politically left, right, or in the middle? What if it didn’t matter if you were educated, uneducated, employed or unemployed? What if it didn’t matter if you lived in a mansion, an apartment, a hut or on the streets? What if it didn’t matter if you were rich, poor, or somewhere in between? What if it didn’t matter if you were Christian, Jewish, Muslim or something else? What if it didn’t matter if you were straight, gay, bisexual or trapped in the wrong gender? What if it didn’t matter if you were fat, skinny, short, or tall? What if it didn’t matter if you were physically ill, mentally ill, or healthy? What if it didn’t matter if you were young, middle-aged or ancient? What if it didn’t matter if you were happy, sad, alone or overwhelmed in a crowd? What if your status wasn’t determined by birth, religion, gender, or economics? What if it didn’t matter if your hair was blond, brown, red, black or purple? If your eyes were blue, green, brown or black? If you spoke Hebrew, Arabic, English, French, Spanish, Chinese, Polish, German, Russian, or Pig Latin? If you were Asian, African, European, North American, Hispanic, or Middle Eastern? If you had a high or low IQ, EQ or cholesterol level? who just happen to have a variety of different outer shells and experiences? that you strove to find beauty and goodness and meaning in others and in all that you do? I want to make a conscious effort to live these values in my life. I know I won’t always be successful, there will be days when I fall short but if I can become aware of the times I don’t quite measure up, I can correct myself and begin again. What do you think? What are some of the things you could do differently? Every now and then I look at the links WordPress recommends. I was quite moved by the link below. If you have a moment, give it a read. It really is quite powerful.